The release of Windows 8 has started to bridge the gap between tablets and notebooks. Although the ARM-series of processors has been getting more and more powerful - two and even four cores, 3D graphics - they never really had a platform to develop their full potential. Windows 8 is about the change that: the new OS, with its touchscreen-interface on top of the well-known desktop, features the diverse software offerings we've come to expect from Windows. Most of us are quite familiar with Intel's Atom processors, as they were once ubiquitous in the now pretty much defunct netbook-category. Atom CPUs have a new lease on life: Intel's Atom Z2760 is used in many different Windows 8 tablets, and is starting to become a serious competition for CPUs based on the ARM architecture. The 32-bit dual-core CPU is of course not nearly as powerful as full-sized notebook processors, but with a TPD of 1.7 Watts it is frugal, which extends battery life. The Dell Latitude 10 ships with 2 GB of RAM and 64 GB of storage - sufficient only for less demanding desktop and office-type tasks. The first impression confirms it: the Dell Latitude 10 comes closer to emulating a notebook than any Android tablet could ever hope to. Even though some of the devices were designed as convertibles and featured keyboard-docking stations, they usually lacked a replaceable battery. Dell also offers a docking station, which adds additional ports and makes the tablet suitable as a desktop PC replacement. Dell offers many different configurations: the user can decide between batteries with 30 Wh or 60 Wh capacity, eMMC storage of 32 GB and 64 GB, and choose a UMTS module, if required. The slot for the microSIM card is located behind the battery. The least expensive version of the tablet retails for 499 Euros (~$650); our top-of-the-line review unit costs 785 Euros (~$1000). Either way: for a tablet with an Atom processor and Windows 8, the Dell Latitude 10 is expensive. Notebooks offer a lot more performance for this kind of money. With features like a TPM chip, Dell targets business more so than home users, however. The Dell Latitude 10 only comes in an unobtrusive black color. The touchscreen bezel is glossy; the back of the unit sports a no-frills matte finish. The edges of the tablet feature a non-slip rubber coating, which wraps from the back to the front - the display features Corning Gorilla Glass - without any unsightly gaps. The buttons are also integrated into the rubber and feature a distinct click point - although actuation requires significant pressure. According to Dell, the back of the unit features magnesium to increase strength. The tablet is quite sturdy and overall well made. Weighing in at 820 grams (1.81 pounds), the Latitude 10 is a heavyweight among Windows 8 10-inch tablets. Before we go into specifics, please note that we tested the tablet with the heavier battery (60 Wh), which not only increases its weight by 170 grams (0.37 pounds), but also the thickness. The iPad 4 comes with a 42.5 Wh battery and weighs 653 grams (1.44 pounds). The Asus VivoTab Smart features the same Atom processor, a battery with a capacity of 25 Wh, and weighs in at 570 grams (1.26 pounds). Although a docking station is available as an accessory, the tablet itself has plenty of connection options. On the right side, Dell includes a full-size USB 2.0 port - other tablets, like the Asus VivoTab Smart, only come with a microUSB port. When the tablet is inserted into the docking station, said USB port is deactivated - but the dock itself has five USB ports, which should be more than sufficient. On one side of the USB port there is a microHDMI port, on the other the 3.5-millimeter combination audio jack, which accepts headphones, external speakers, and microphones. The bottom of the unit houses the proprietary charging port, which is also utilized by the docking station, and an additional microUSB charge port. To insert the microSIM card, the battery needs to be removed. The preinstalled OS Windows 8 Pro almost seems tailor-made for tablets like the Dell Latitude 10. The well-known Desktop underneath the novel tile interface does not offer any real surprises - but it does offer voice control now. It would be nice if this feature was working as it should however, we had to more or less yell at the tablet to open programs...and very clearly and slowly to boot. As long as the voice control feature does not work as well as it does for the current crop of smartphones, it is more or less useless. The Dell Wireless 1536C module supports WLAN standards 802.11 a/b/g/n - the Windows tray icon shows 2 of the 5 bars 10 meters (~33 feet) away from the router in our test environment. In addition, Bluetooth version 4.0 LE (low energy) is also supported. The 3G/UMTS module (Dell Wireless 5565) is responsible for mobile Internet connectivity. HSPA+ theoretically allows a throughput of 42.2 Mbit/s. The back houses an 8-megapixel camera, which features a resolution of 3264x2448 pixels. The quality is on par with an inexpensive, but decent digital camera: outside, we were able to capture nice enough images. Low light results in a lot of noise, however. The LED flash automatically helps out in low-light conditions, but is not really sufficient most of the time. The 2-megapixel camera up front compares best to the ones found in notebooks. 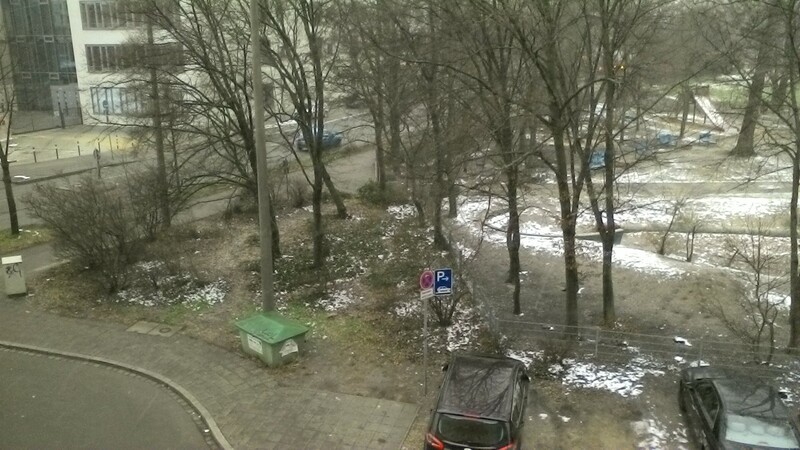 The photo we took outside also shows some issues with the color temperature. At best, the camera is useful for video conferencing - but it was designed for just that. ...with many additional USB ports. The only accessory included is the 30-Watt power adapter. We already mentioned the optional docking station, which not only offers HDMI and Gigabit LAN, but also five USB 2.0 ports. One of these ports is right next to the audio combination port (also found on the tablet itself). Because of the additional ports, the Dell Latitude can be used as a desktop replacement. The docking station itself appears to be well made, has a low center of gravity, and holds the tablet securely in place. Dell sells the docking station online for 159 Euros (~$200). In addition to using the touch interface, the user can also control the tablet with the active Wacom stylus. The stylus has its own button and either end is usable. Dell sells it for 48 Euros (~$60); several other sources have it for a little less. The "Griffin Survivor Protective Case" is supposed to protect the tablet against humidity, sand, dirt, and vibrations. At the point of this writing, the case is not available in Germany. Users wanting the drivers on DVD can order one at the time of purchase for 5 Euros (~$6.50) - although the same drivers can be downloaded free of charge from the support website. The standard warranty includes one year of pickup and return service. Dell offers different "Support Services" on their website: three-years on-site service (next business day) cost 48 Euros (~$60). For the same price, Dell offers one year of "Pro Support", which includes the on-site service but also technical support (even for software issues). Three years of Pro Support are available for 96 Euros (~$125). In addition, the user can opt for accidental damage protection for one year for 85 Euros (~$110). In case of an accident, the tablet will then be repaired - or replaced, if a repair is not possible. For 25 Euros (~$32), Dell also offers a "stopTrack" theft protection, which is mostly a deterrent. 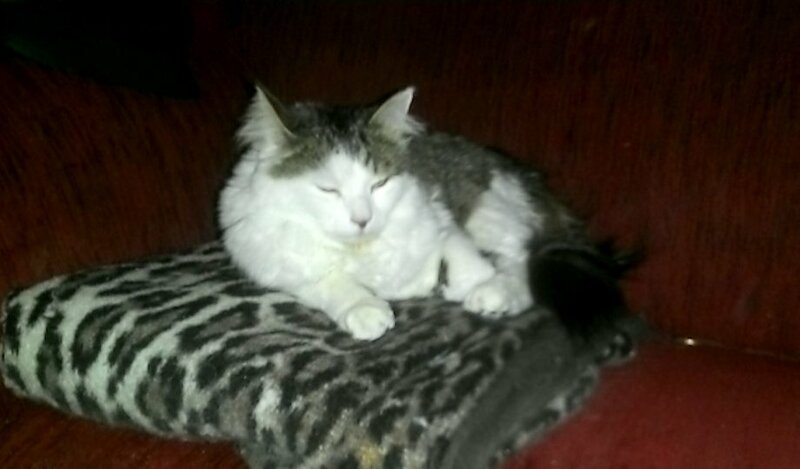 Honest finders can enter a code on a website and inform the original owner that the tablet has been found. The capacitive touchscreen works well when using one's fingers to control it. 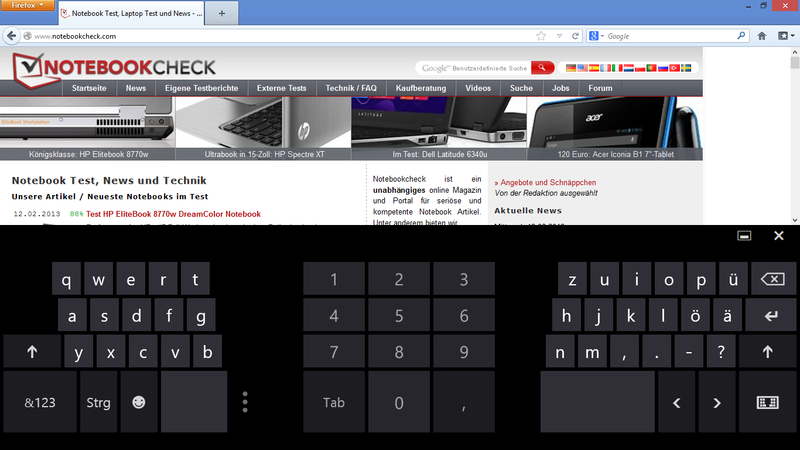 The virtual keyboard Windows 8 ships can be used for 10-finger typing - although it is not nearly as fast or comfortable as a regular keyboard, which offers much better feedback. 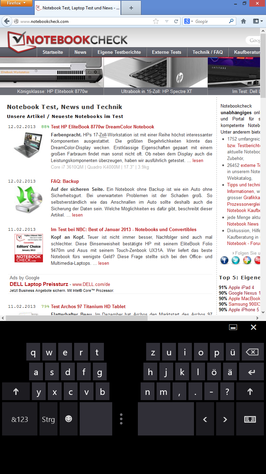 The virtual keyboard also takes up about half of the screen in landscape mode. For touch typists we definitely recommend an external keyboard. The 10-finger touch keyboard also has its limits: it cannot be used when holding the tablet with both hands. Fortunately, there is a split version of the layout, which allows using the thumbs. Both layouts work well in portrait mode. The Wacom stylus allows the user to convert their handwriting into typed text. Even though this works pretty well, it is not nearly as easy and quick as when using the fingers. Those who are familiar with using a stylus on an Android device will have to get used to the change in functionality: a single tap on the Desktop is not the same thing as touching the screen with a finger. Double-clicking is possible with increased pressure - otherwise, the object/text just gets marked (same as with a single mouse click). Marking text is also possible if the user moves the stylus lightly over the screen - this also opens "balloon tips" much in the same way as hovering a mouse pointer over an object does. The upper end of the stylus functions like an eraser, which is really useful when drawing freehand. Palm check does not always work accurately - sometimes, the palm can be interpreted as a finger, which can be annoying. Finger input can be deactivated in the settings, which is a bit cumbersome. The display also responds to the amount of pressure that the user applies with the stylus - interesting for graphic artists. As we previously noted, the active digitizer allows the capacitive touch display to receive input using both the fingers and the stylus. The 10.1-inch display features a resolution of 1366x768 pixels - pretty common for screens this size. Using the HDMI port, the Latitude 10 supports Full HD resolution on external monitors. The average display brightness of 450 cd/m² is sufficiently bright even for outdoor use. The reflections on the glossy screen distract a bit - but most tablets with touchscreens have the same issue. The contrast ratio of the IPS panel is an excellent 1516:1 - even better than the already very good result of the Asus VivoTab TF801C. The color temperature is pretty close to the ideal of 6500 Kelvin - we measured 6691 K. The color accuracy out of the box is not that great: especially blue and magenta are far from the ideal (DeltaE 19.5 and 9.2, respectively). Color saturation is also along the same lines - especially at a saturation of 20%. Gray levels are reproduced quite well, though. 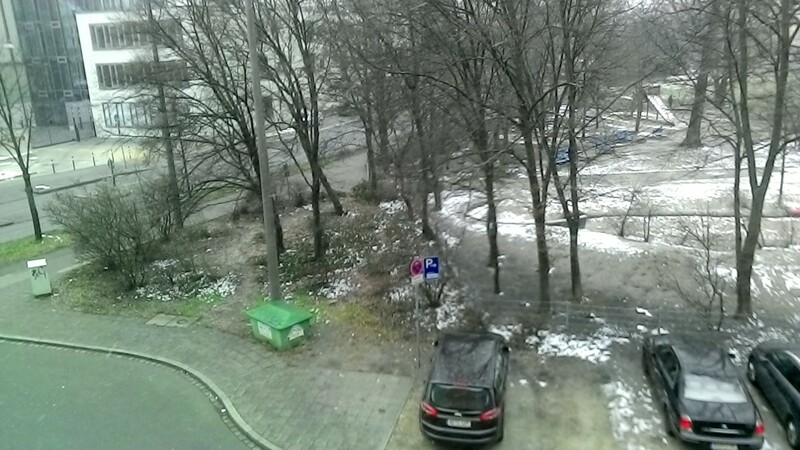 A test outdoors confirms that the tablet is quite usable due to the high brightness and very good contrast ratio. The reflective screen does take away from the performance, though - we recommend staying in the shade. If it is not too sunny (see our pictures), the Latitude 10 works well outside. 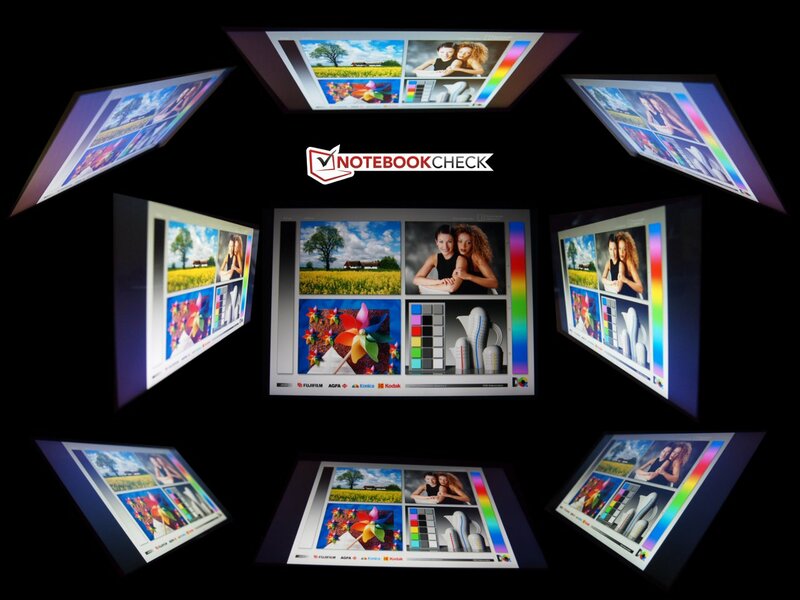 The display panel uses IPS technology - and it shows as far as the viewing angles are concerned. TN panels do not compare and are subject to changes in picture quality pretty much immediately. The panel used in the Latitude 10 only shows slight color changes at very extreme angles. 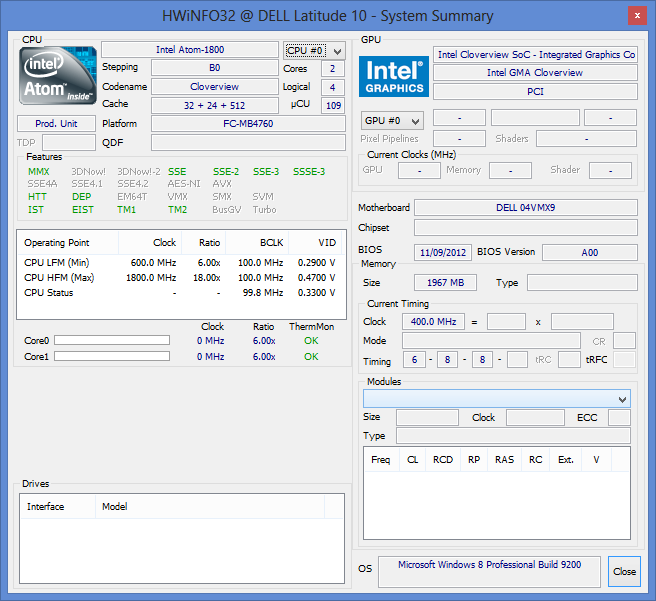 The Latitude 10 incorporates the Intel Atom Z2760. This SoC (System on a Chip) integrates both CPU and GPU in one unit. As a member of the Atom series, clearly Intel's main goal is energy conservation and not flat-out performance. Because of the very low TDP (Thermal Design Power) of 1.7 Watts, the Z2760 is suitable for slim and passively cooled systems. In addition, the tablet comes with 2 GB DDR2 SDRAM (running at 800 MHz) and TPM-compatible eMMC flash storage with 32 or 64 GB - our review model features the latter. The processor component of the Intel Atom Z2760 features dual cores running at 1.8 GHz, which idle at 600 MHz to conserve power. Each core can execute two threads for a total of four. Even though the cores are theoretically designed for 64-bit, the Intel chip only supports 32-bit. Because of that, its performance is more comparable to the ARM processors found in tablets and smartphones - like the Nvidia Tegra 3 - and not other x86 processors. A look at the benchmark results reveals that AMDs E1-1200 offers more than 50 percent more performance when tasked with single-core rendering. The 64-bit AMD processor also has a much higher TDP of 18 Watts (compared to 1.7 Watts for the Atom) and is therefore predominantly used in notebooks. Surprisingly enough, the Z2760 offers the same performance as the AMD E1-1200 during the multi-core test. 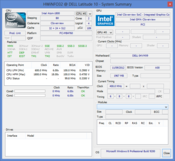 Most likely, Intel's hyperthreading technology has distinct advantages here. The difference to i3 CPUs is substantial: the Intel i3-3110M, which is used in entry-level notebooks (an example is the 15-inch Acer Aspire E1-571G, which retails for around 500 Euros / ~$650), scores about three times higher than the Atom CPU. The CPU benchmarks make it clear that the Latitude 10 will not be able to deliver performance equivalent to a notebook. Because of Windows 8, quite a few office-type applications are available and work well- a significant advantage compared to Android and iOS. Together with the docking station, the Dell tablet makes for a better PC replacement than devices with other operating systems. Because of the low performance of the Atom SoC, compromises are necessary: the GPU part, for example, does not support DirectX 10 on up. CPU intensive tasks like photo and video editing are better suited for conventional notebooks - simpler tasks like spreadsheets and word processing the tablet handles well. We did not have a lot of options as far as running benchmarks is concerned. Pretty much all notebooks support 64-bit operating systems and applications, so a direct comparison is difficult. To evaluate overall performance, we used PCMark 7. 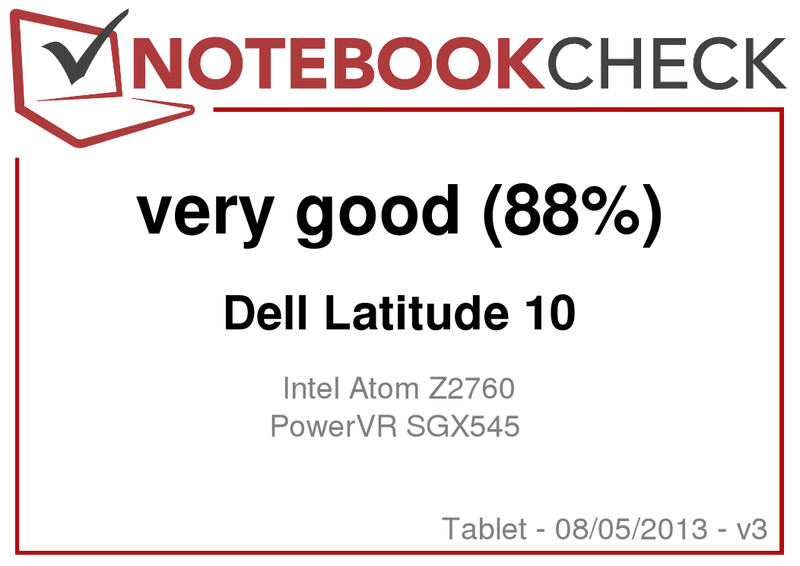 Not surprisingly, the Dell Latitude 10 scored similar to other tablets with the Atom processor. 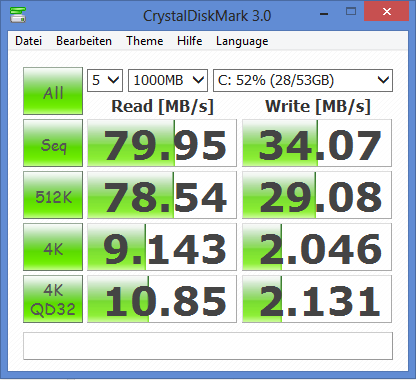 AMDs E1-1200 in the HP Pavilion dm1-4200sg falls behind our test candidate by more than one third. 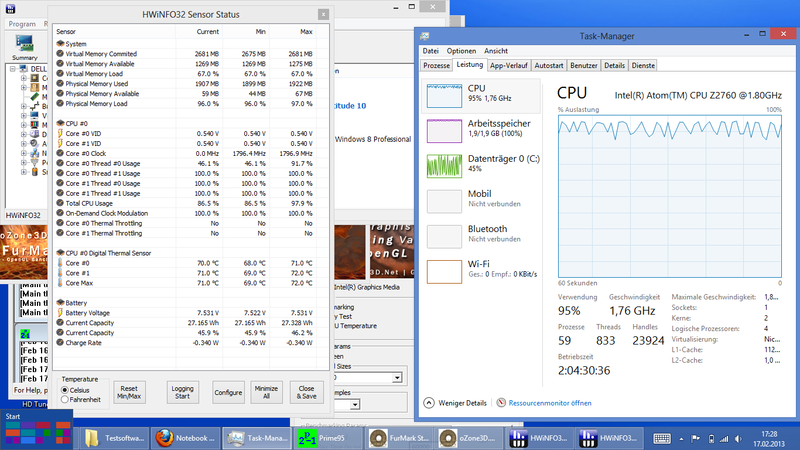 The Acer Aspire E1-571G with its i3 processor, on the other hand, outscored our tablet by 67%. The cross-platform benchmark Geekbench 2 shows that the class leader iPad 4 is still a bit more powerful: its score was about one third higher. The eMMC flash storage features a capacity of 64 GB and cannot really be compared to the much faster SSDs. The reason why it is used in tablets has to do with the compact dimensions and low power consumption. We saw an average transfer speed of almost 80 MB/s during sequential reads - quite comparable to other tablets, like the Asus VivoTab TF810C. 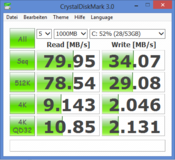 Compared to regular hard drives, the eMMC flash has advantages when dealing with smaller block sizes. The Intel Atom Z2760 comes with integrated graphics based on the PowerVR SGX 545, which features a clock speed of 533 MHz. DirectX is not supported - so most 3DMark benchmarks won't run. Normally, this GPU supports DirectX 10.1 - but not in this Atom chip. The only benchmark we were able to use is 3DMark 06. The Atom SoC does not have a lot of power to spare - so as far as PC games are concerned, our expectations are low. We tried Starcraft 2 and recorded a paltry 11 frames per second - even with the resolution and details set to their lowest levels. The tablet is only suitable for "casual gaming" - games like Solitaire, Minesweeper, and others. The Appstore that comes with Windows 8 offers further choices. The tablet is passively cooled and completely silent. The only areas that get warm are around the location of the cameras. During our real-life test, the tablet never exceeded 30 degrees Celsius (86 degrees Fahrenheit). When we ran our stress test (Prime95 and FurMark together), the CPU only reached 77 degrees Celsius (170.6 degrees Fahrenheit - far from critical) and the tablet itself a maximum of 44 degrees Celsius (111.2 degrees Fahrenheit). Subsequent testing after the stress test with Cinebench R10 and 3DMark 06 revealed no decrease in performance. The back of the tablet houses two speakers, which are "high quality" - at least according to Dell's spec sheet. We were not too impressed: the sound quality is on par with a middle-class smartphone. Mids and bass are definitely lacking, which makes external speakers or headphones a necessity if music is on the agenda. Depending on the applications in use, we recorded a power consumption between 2.7 and 11.2 Watts. The Asus Vivotab TF810C features the same processor, but needs a few Watts less on the top end - the reason could be the display panel, which does not get as bright as the one the Dell Latitude 10 uses. The power adapter supplies 30 Watts and has more than enough power. 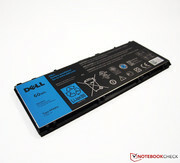 Dell offers either a two-cell battery with a capacity of 30 Wh or a (much heavier) four-cell battery with 60 Wh. Of the tablets we mentioned before, the Asus VivoTab TF810C comes closest, as it has a main battery of 30 Wh and features an additional battery in the keyboard dock with 25 Wh. HP's Envy x2 11 has a main battery with 26 Wh and an additional one with 25 Wh integrated into the dock. Dell's XPS 10 Windows RT tablet has only the main battery with a capacity of 28 Wh. Our review of the Envy x2 11 attests the device’s "exceptional" battery life - and we called the Dell XPS 10 a "Marathon tablet". The Dell Latitude 10 has no problem raising the bar: featuring the largest battery in a tablet ever, it outlasts all other tablets in this area. When we ran the Battery Eater test, we recorded a battery life of almost 30 hours. If the Latitude is used as an eBook Reader (with Wi-Fi turned off and the screen set to its lowest brightness), the tablet lasts longer than a whole day. 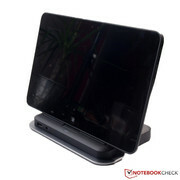 The Asus VivoTab TF810C needs the battery in its dock to eek out an additional 3 hours. 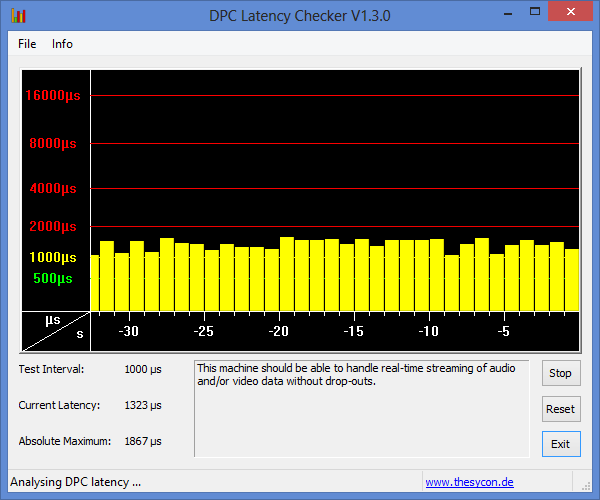 The WLAN test is more realistic: we set the screen to medium brightness and use a script that cycles through different websites. The tablet lasted about half the time - but 15 hours are still very good indeed. With the brightness set to its maximum and the hardware under load, the Latitude 10 still lasted longer than the other three tablets we mentioned in this review - a record-setting 7 hours and 45 minutes. The Latitude 10 supplies sturdiness and security instead of good looks and gimmicks. Dell designs this tablet for business use - and does it right. There are definitely better looking and more powerful tablets out there - but that is important for the private and not the business user. As long as looks are not of the utmost importance, the chassis is a good one. It is unobtrusive and built very well. Because of its excellent display and the high maximum brightness of over 450 cd/m², the tablet can also be used outdoors - even though the screen is reflective. The IPS panel also has exceptional viewing angle stability. The overall quality of the display compares well even with higher-priced devices. The tablet is not really well suited for multimedia tasks - not surprising, since business users usually do not need the best sound and high quality cameras. As such, the Latitude 10 is no substitute for a digital camera - the quality of the pictures is not good enough. For listening to music or watching movies, we recommend using headphones - the speakers cannot convince. The plethora of accessories allows for increased flexibility. The docking station adds several USB ports and an additional full-sized HDMI port. 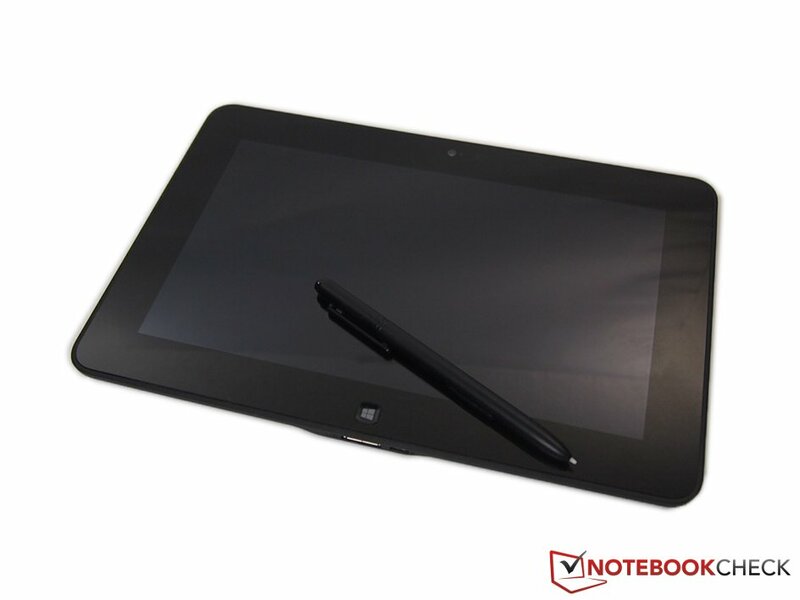 The active Wacom stylus turns the tablet into a notepad. While the pressure-sensing technology works well for drawing, the palm check feature is not quite as robust. Tablets usually don't have replaceable batteries, so we appreciate the fact that there are two to choose from: either a small and light one with 30 Wh or the heavier model with 60 Wh. Only some convertibles come close in capacity - if you also count the battery in the dock. The large battery allows for a runtime of up to 30 hours when the tablet is used as an eReader; the 15 hours we recorded during our WLAN test are also very decent, since the Latitude 10 lasts almost for two workdays without needing a charge. The only disadvantage: the larger battery pushes the weight of the unit beyond 800 grams (1.75 pounds) - something to consider. Although the overall performance is pretty average, it is still good enough for simple office tasks. Those who do not need a top performing tablet but rather want a sturdy and secure device should definitely consider the Dell Latitude 10. Finally: software supported under Windows combined with the usability of a tablet. Dell also offers many different configuration options - a clear advantage. UMTS and an active stylus are also noteworthy features. More power. Compared to the processors used in notebooks in the same price range, the Intel Atom Z2760 is pretty weak. The battery life. Those who are happy with less can opt for the smaller battery. The display is outstanding: both brightness and quality are top notch. Tablets with Atom CPUs and Windows are going mainstream. The Asus VivoTab Smart ME400C and the convertibles Asus VivoTab TF810C and HP Envy x2 11-g000eg use the same processor. The Dell XPS 10 uses ARM architecture and Windows RT.